Full of gorgeous, brightly colored illustrations, Playing in the Park is a picture book with a very catchy rhyming story. 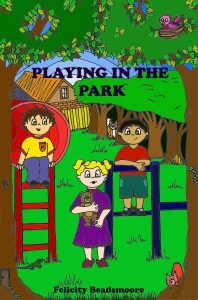 While also dealing with the issue of safety, Playing in the Park is a cheerful tale which helps young children learn how to deal with the difficulties of a bossy playmate. Enjoy searching for all the curious critters that go along for the journey as the children learn a very important lesson about playing and friendship.